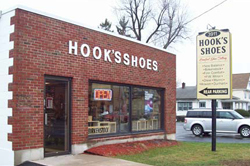 Hooks Shoe Stores Inc. has been providing custom orthotic shoes to customers throughout Buffalo, NY since 1946. We have evolved from an orthopedic shoe store into a full-service shoe store with an extensive selection of dress shoes, athletic shoes, shoes inserts, and other products to keep your feet comfortable. We pride ourselves on customer experience with a family-oriented feel. Whenever you come to us, we will measure your feet to ensure you are getting the best fit and feel. We offer highly personalized service so that you feel at ease shopping for shoes and shoe products without feeling uncomfortable. Whether you require special footwear for a diabetic condition, need custom orthotics, or just have hard to fit feet, our experienced and knowledgeable staff can help you find the right shoe. Our team can professionally measure your feet to find you the best fit for diabetic footwear, custom orthotics, or hard to fit feet. We strive to match you with the most comfortable shoe you will ever wear. We are able to fill doctors’ prescriptions to help alleviate pressure points or create custom fitted inserts for shoes. For your ongoing care, we perform all repairs on site so that we can take care of normal wear and tear, do any modifications or refitting, and get your shoes back to you as soon as possible. A properly fitted shoe can have a profound impact on your daily routine. It can change your posture and relieve pain in your feet, legs, and back. We specialize in finding the right fit for you to ease your pain or increase your comfort. If you have a difficult time finding shoes that fit properly, we offer more options for a better fit. Our fitted shoes work for individuals who need narrow to extra wide shoes, custom fitted inserts for shoes, or have high arches to particularly flat feet. No matter what difficulty you have when looking for the perfect fit, stop by today to talk to our staff about the right footwear for you. Call (716) 831-2952 or stop by our store to learn more about being fitted for custom orthotics or diabetic shoes. Our friendly staff can help you find what you need. We have the shoes, inserts, and socks to keep your feet, legs, and back feeling comfortable.